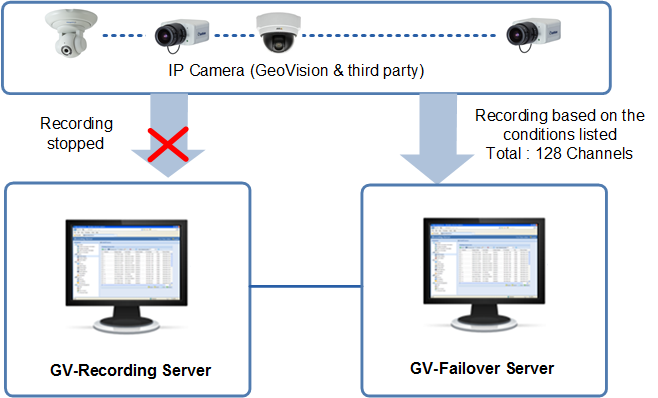 GV-Failover Server is a video backup server that records up to 128 IP streams from hosts GV-Systems / GV-VMS / GV-Recording Server when any of the following conditions occurs: (1) when the host GV-System / GV-VMS / GV-Recording Server starts up without monitoring; (2) when file recycling fails; (3) when there is an error in the hard drive; (4) when the connection between host and IP camera fails; (5) when the host GV-System / GV-VMS / GV-Recording Server fails. 1. GV-Failover Server does not support GV-VMS hosts when they are running in service mode. It is highly suggested not to enable "Service Mode". 2. 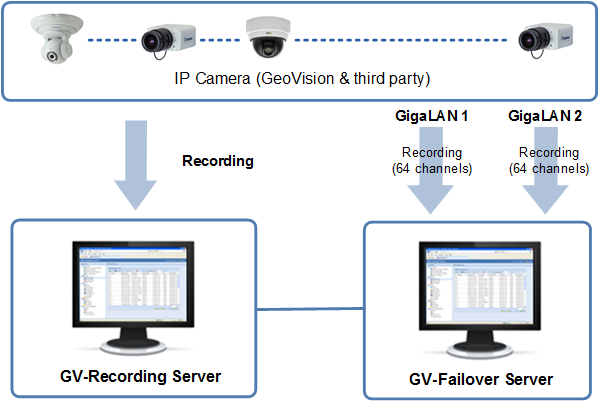 The GV-Failover Server does not support backup of analog cameras. Servers meeting the following minimum system requirements have the capacity to receive up to 128 channels. The recommended hard disk requirements for 24 hours of recording are detailed below. For optimal performance and processing efficiency, it is advisable to use two Gigabit connections, each assigned with 64 channels and run through separate network. The suggested deployment of Gigabit connections for recording is illustrated below. 1. host GV-System / GV-VMS / GV-Recording Server is connected but not recording. 2. recycling of video files fails at host GV-System / GV-VMS / GV-Recording Server. 3. an error occurs in the hard drive at host GV-System / GV-VMS / GV-Recording Server. 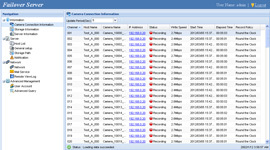 4. the connection between host and IP camera fails. 5. the host GV-System / GV-VMS / GV-Recording Server fails. 1. 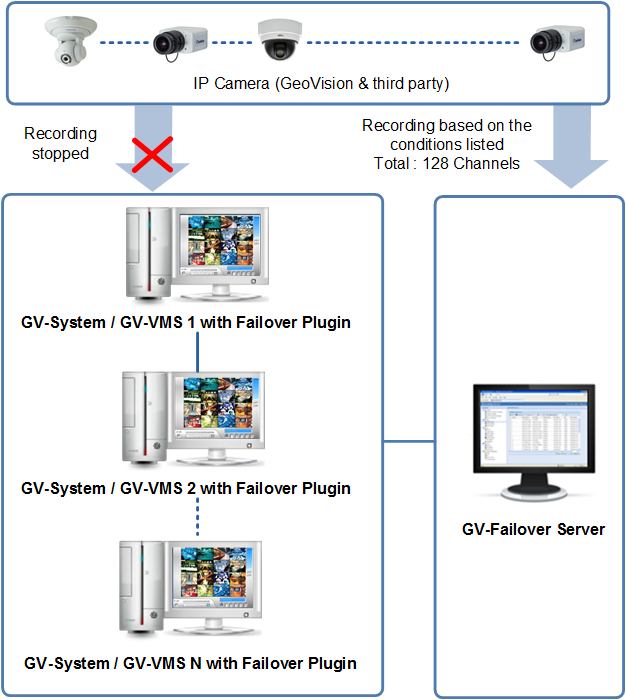 The GV-Failover Server and GV-Recording Server can not be run in one PC at the same time. 2. 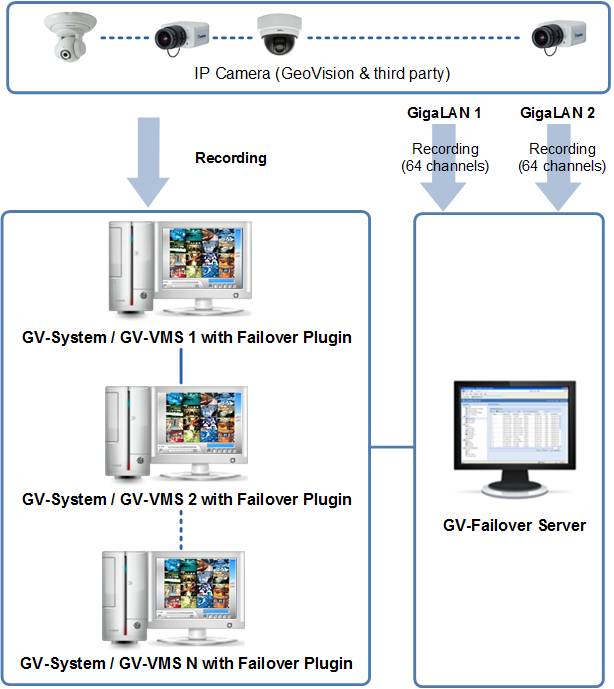 GV-Failover Server is only compatible with GV-Recording Server V1.2.5.0 or later.